Benoît Hamon. Credit to: L’opinion. 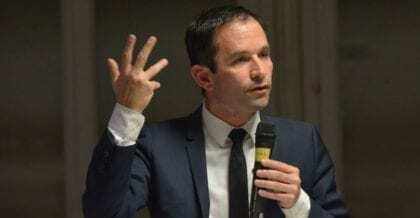 Though Socialist candidate Benoît Hamon did not make it to the second round of the French presidential election, he has attracted attention through his proposal for a version of universal basic income (UBI). 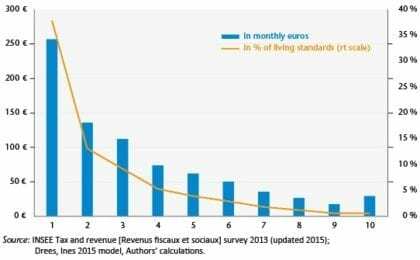 An article by the French Economic Observatory (OFCE) explores the way Hamon’s UBI proposal might be implemented into an existing French system that already has redistributive programs such as the RSA (Revenu de Solidarité Active), which provides a level of income for households without a source of it. Hamon’s proposal for basic income may effectively supplant these programs, but it does not describe how a basic income will interact with them. Nonetheless, with certain conditions applied, the plan should give benefits to 11.6 million people, or 17.5% of the French population. The amount paid will adjust to various conditions such as marital status and dependency on parents. The version of the plan as described by the OFCE describes a basic income of 600 euros per month, starting for those with no income, and then gradually tapering the payments off to incomes 1.9 times the French minimum wage, which is 9.76 euros per hour as of 2017. The base system will taper off payments by using a formula, which subtracts 27.4% of the total income of a taxable household from the monthly payment of 600 euros. Because the payments are adjusted and distributed in a single step, this system more resembles a negative income tax than a universal basic income, where a UBI system would pay an equal amount to everyone first and then take taxes out. This system is not automatically individualized for everyone either, as married couples can choose to file their taxes jointly or individually depending on their financial situation. The implementation of this proposal will also matter greatly, specifically as it is overlaid onto the existing French system or proposed in addition to it. Using a micro-simulation model (see OFCE article for details), the authors provide estimates of the net benefits to tax households composed of one adult, using the latest available data (2015). They use a model which assumes that the UBI will overlay the existing French system, and therefore subtracts benefits already provided by the state. This model also excludes individuals aged 18-24, who still report under their parents’ tax household. Given the model’s parameters, households within the first decile of living standards would see a rise of 38%, or 257 euros/month, to their income. The second decile would increase 13%, or 137 euros/month, and so forth until it expires for those making about 2,800 euros/month, or 1.9 times the French minimum wage. As a result, the poverty rate, as defined by the share of French households who live on about 1,000 euros per month, is projected to drop 4.9% down to 8.5%. The Gini coefficient would also drop by 0.04 points to 0.26, and would put France from an average level to one of the least unequal nations in the European Union. Much still depends on the implementation of the program. As it stands, the OFCE model projects total expenditures of 30 billion euros; close to Hamon’s projection. However, if young adults ages 18-24 who still report under their parents’ tax household are given a basic income, expenditures would rise to 49 billion. These features suggest that certain groups will be given new incentives within this system, such as individuals within the age range of 18-25 and married couples who can choose to file jointly or individually. To finance this UBI program, the authors make clear that hikes in tax rates for the highest incomes would be necessary. Personal work income taxes alone bring 74 billion euros annually, but France’s state expenditures are already quite large. New tax bases, like France’s ISF wealth tax which draws revenue from assets like real estate, may be needed to help finance this proposal. Please consider the Global Resource Bank program for a universal basic income.